Happy official first day of spring! I'm beyond ready for a little warmer weather, some sunshine and a few flowers...aren't you? 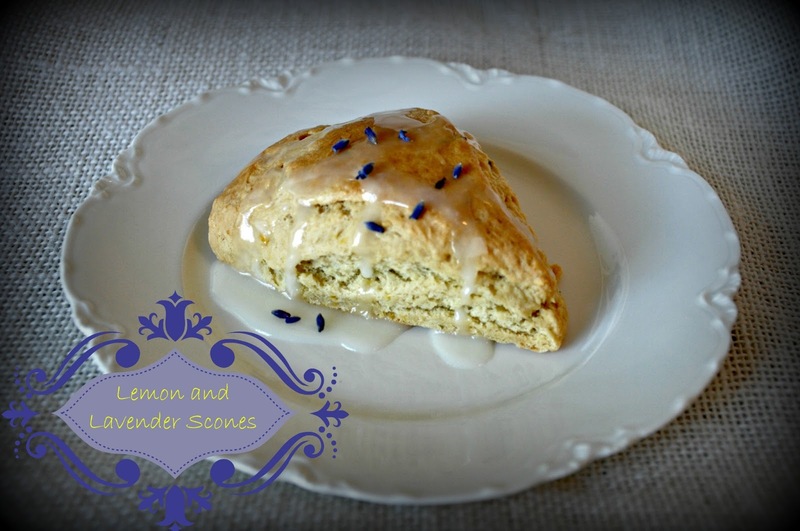 I'm celebrating today's vernal equinox by baking one of my favorite spring treats: Lemon and Lavender Scones. 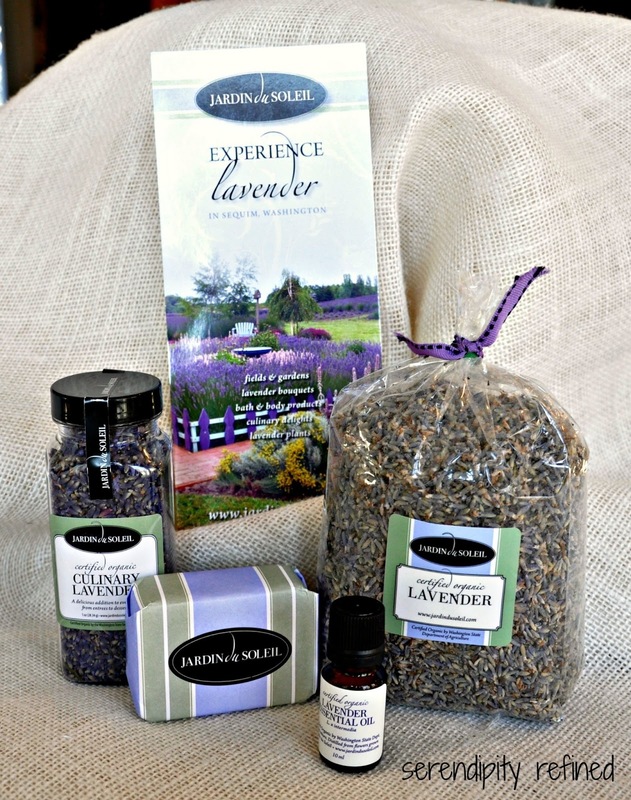 I'd also like to introduce you to Paul and Jordan Schiefen who have the enviable task of spending their days raising organically grown fields of my favorite herb at Jardin du Soleil lavender farm and store in Sequim, Washington. I first met Paul and Jordan a couple of months ago because they noticed that I have just a slight obsession with all things lavender... okay, slight is probably an understatement. I'm crazy about the stuff! Honestly...look at them....who could resist?! The buds are large and clean; the color is the most beautiful shade of lavender blue that I've ever seen and the smell... Oh. My. Goodness! Just a few days later, I received a package in the mail. It made me think of spring! It smelled so incredible that I knew what it was even before I opened it... and I knew immediately that the first thing I was going to do with the culinary buds was to bake scones! This recipe was originally adapted from Leslie Mackie's, Macrina Bakery Cookbook. 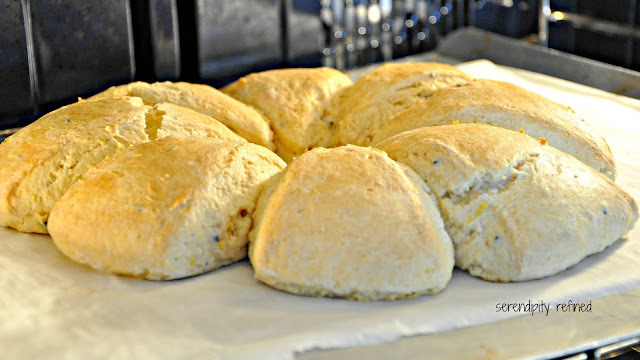 Like most of the recipes that I use, it's a straight forward buttermilk scone recipe that produces consistent results and is so easy that after the first few times I made it, I had it memorized. Preheat the oven to 400 degrees (375 if you have a convection oven like I do). There may also be special instructions for high altitudes but since I do all of my baking in the great flat lands of the state of Illinois, altitude isn't really an issue. In a large bowl, combine flour, sugar, salt, baking powder, baking soda, lemon zest and one and a half teaspoons of lavender. Cut the butter into pieces and then cut it into the dry ingredients with a pastry cutter...or use your fingers, I promise that I won't say a word. In a separate bowl that you realize immediately is far too small for what you're trying to do, gently whisk together the buttermilk and the yogurt trying desperately to ensure that most of what you're whisking stays inside the bowl and doesn't end up all over the towel, the counter and part of the floor. Combine the wet and dry ingredients in the larger bowl to form a dough that will be sticky and moist. Resist the urge to add more flour. I mean it. Don't do it ....well....unless you like scones that are so dry that they'll soak up an entire cup of coffee or two thirds of a glass of milk and will have the flavor of paste (with a slight hint of lemon and lavender). 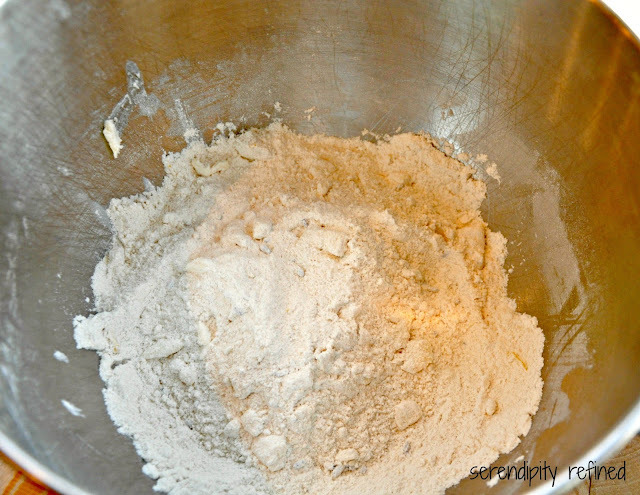 Turn the dough out onto a floured work surface....or, get a spatula and scrape the dough out of the bowl into the middle of a floured work surface. Again, no one is looking and I'm certainly in no position to judge...how do you think it is that I know this stuff !? (shhhh!) 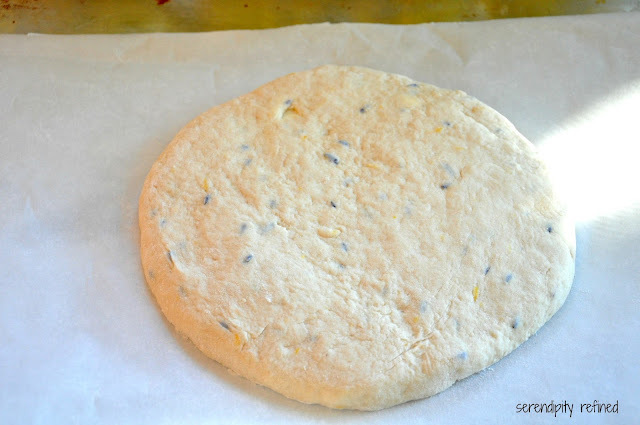 Knead it a couple of times and form it into a circle that's about an inch thick. It doesn't have to be a circle...it can be a rectangle, square or trapezoid. I don't think that there are any specific rules when it comes to the shape of scones...I've seen them cut into little tiny circles and it doesn't affect the flavor one bit. Cut the circle into eight pie shaped wedges. If you chose another shape, I'm afraid that you're on your own. If it's a rectangle, then simple "bread stick" shapes would work, if not, I'd suggest a calculator and maybe some graph paper to determine the shape and size for 8 servings. ...good luck with that. Transfer to an oiled baking sheet (I use kitchen parchment because I don't like cleaning baked on cooking oil off of pans it's easier) and bake for 20 minutes or until the tops are golden brown. Cool on a wire rack, on a counter, away from adolescent males who will eat just about anything that's cool enough, and the yellow lab who doesn't even wait that long. 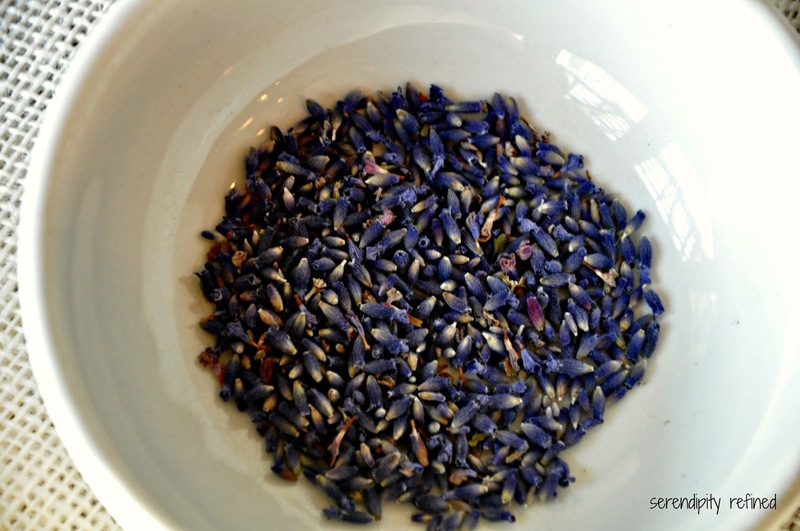 While you're waiting for them to cool, dissolve powdered sugar in lemon juice and add 1/2 teaspoon of lavender. 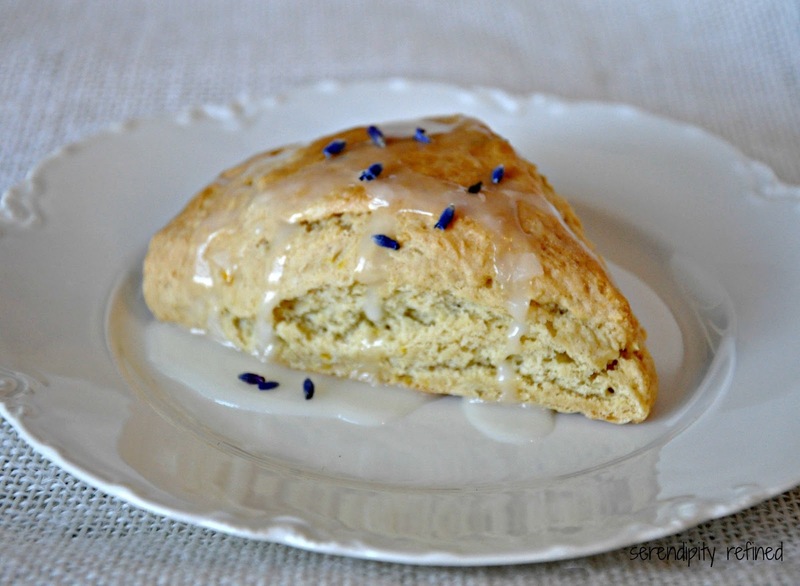 Drizzle over cooled scones, make yourself a cup of tea (or, if you're my friend from North Carolina, get a glass of milk) and Celebrate Spring! This recipe was originally adapted from Leslie Mackie’s Macrina Bakery Cookbook. Preheat oven to 400°F. 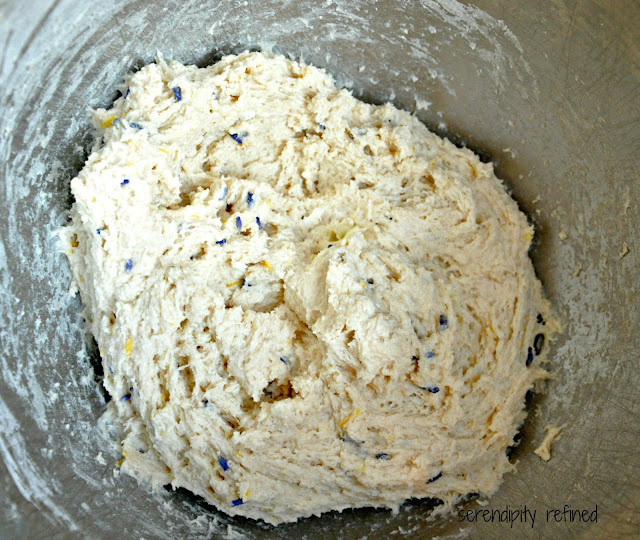 In a mixing bowl, combine flour, sugar, salt, baking powder, baking soda, lemon zest, and 1½ tsp of lavender. 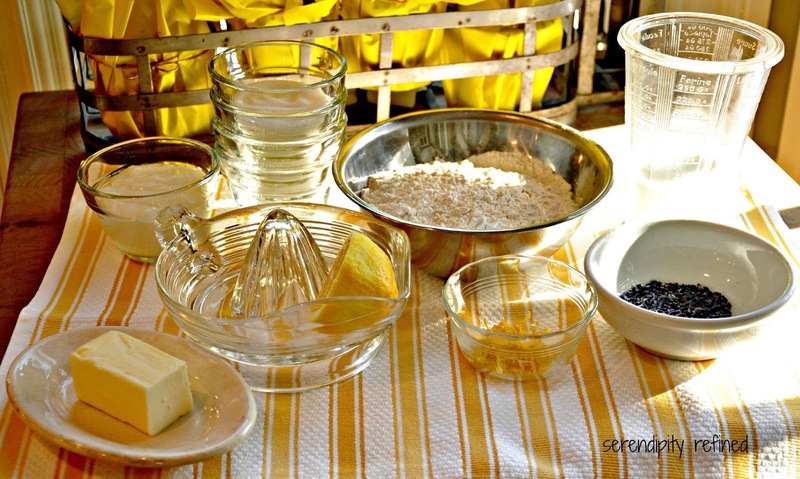 Cut butter into pieces and cut into dry ingredients with a pastry cutter. 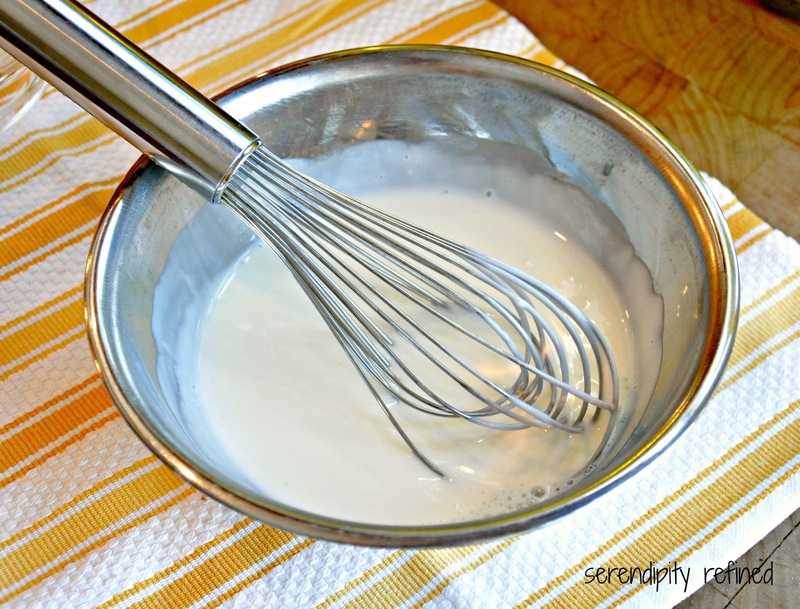 Separately, whisk together yogurt and buttermilk. Combine wet and dry ingredients to form a dough that will be sticky and moist. 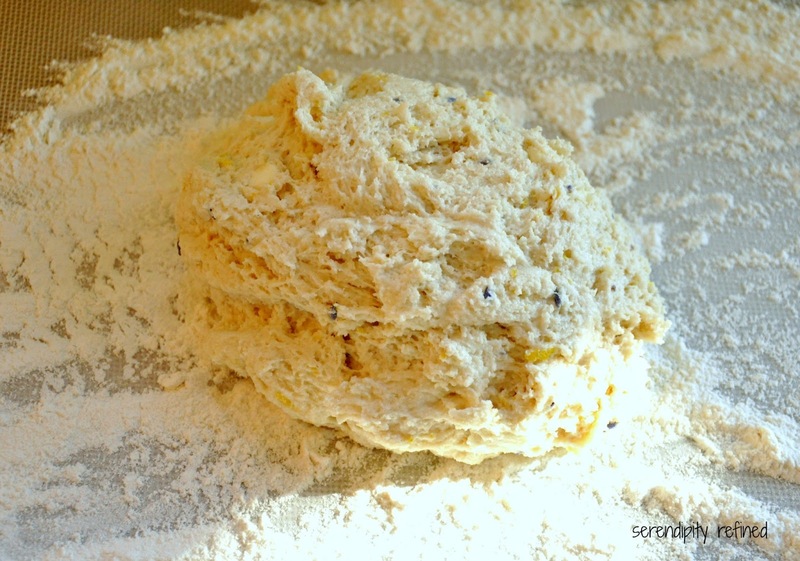 Turn dough out onto a floured surface and knead a few times. Shape into a circle about 1′ thick. 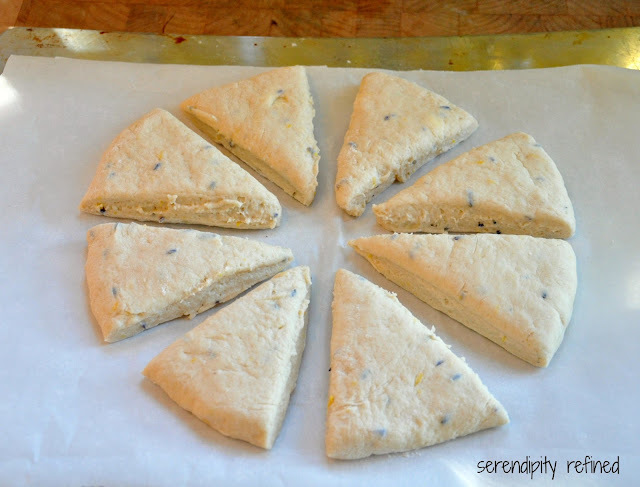 Using a kitchen knife, cut the dough into eight triangles. 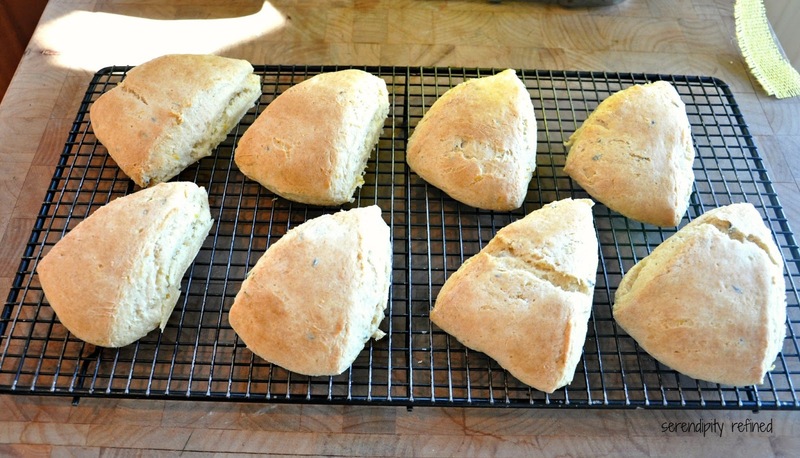 Transfer to an oiled baking sheet (I used parchment paper instead and brushed the tops of the scones with heavy cream). Bake 20 minutes, or until scones are golden brown. Remove from oven and cool on baking rack. 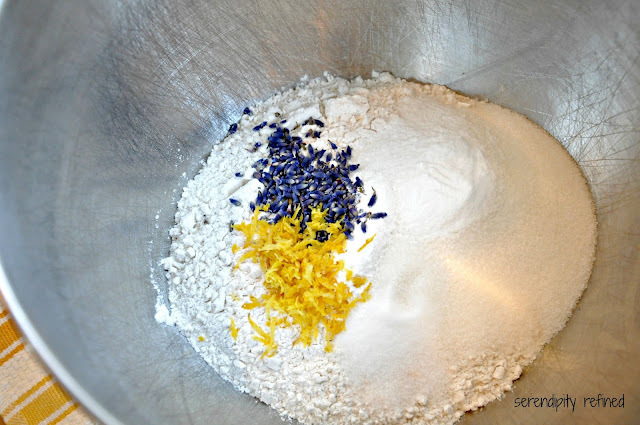 Meanwhile, dissolve powdered sugar in lemon juice and mix in ½ tsp lavender. Drizzle over scones and serve.